No matter whether you call it horse mackerel, beach tuna, black cavalla, or just plain old Jack, the crevalle jack is one of the most enjoyable and commonly encountered pelagic game fish in Mississippi's salt waters. These medium sized coastal maulers are fun to catch, plentiful and taste great to boot. 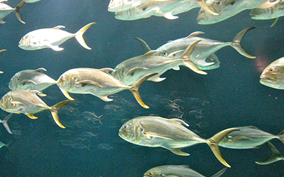 Classified as Caranx hippos, the crevalle jack is in the same family as the pompano and the amberjack. A fast-swimming predatory fish, the jack hunt, usually in packs, in the waters above reefs and in the open sea for anything big enough to fit in their mouth. Their color is overall silver with blue-green to green-gold backs. They are quickly identified by their smushed in face, two sets of dorsal fins, a black spot over their gills and another on their Trex-style stubby pectoral fins. To me they have always had a rather Marlon Brando style mug, with a heavy forehead, round snout, and small jaw. These hearty gamefish ranges from Nova Scotia to Uruguay with some of their largest populations occurring in the Gulf of Mexico. Their spawn in the Mississippi Sound runs March to September, which puts the best time of year to encounter them in the hot months of summer. Crevalle jack are so common in the Gulf that DMR maintain no current limits on their take by recreational fishermen with a saltwater license in state waters south of I-10. Juvenile fish will have stripes much like a Sheepshead and a large eye in relation to the size of their body and should be avoided. The typical Jack found in Mississippi waters run 10-15 pounds with some 20-pounders being found occasionally. However, there are some supersize Jacks poking around out there. The current state record is for a 48 lb. 0.5 oz. fish caught in 1985 by Brian D. Pelton. The current fly record is for a very respectable 28 lb. 15.36 oz. fish pulled in during the summer of 2005 by Dwayne Armes. Both of these compare favorably to the IGFA World Record which since 2010 stands at 66 lb 2 oz. These fellas are found all through the inshore/nearshore areas of the Mississippi Sound and it's not uncommon to run into them fishing in Back Bay Biloxi moving into brackish waters. As such, you can find them near structure, over reefs, and around anchored ships and boats in the coastal harbors. It's common for small boat and kayak-borne anglers to catch them in the rapid cuts and holes around the barrier islands. These supersized pompano like to travel in ocean-going wolf packs that corner small groups of baitfish at the surface and incite a massacre. This habit of Mr Jack and his gang mean that you can get good results drawing in a school of these critters by chumming. Alternatively be sure to take a strong pair of binos out on the water with you and be on the lookout for commotion on the surface nearby-- which will often lead you to the scene of these Jack attacks. Fishing around shrimp and pogey boat activity in late summer brings good results for Jacks as does poking around your shallow water reefs. Judging from their food sources, small minnows (especially pogey and mullet), and shrimp of any varieties bring good results against these silver bellied battlefish. As such any fast-moving shiny bait, real or artificial is almost guaranteed to get the attention of a Jack or three. When they hit, they do it with speed and power, producing some of the most enjoyable fishing in nearshore waters. They will often nosedive towards the seafloor when they set and this causes those who use puny hooks to loose hold of Jack. Bent out or snapped hooks are common when these guys are encountered so come correct on your tackle choices. While many catch and release these hard-hitters, the meat is tasty and can be grilled, fried, or baked. Be sure to bring your seasoning though as they are usually a little bland. Better yet, if you have a lot of Jack fillets laying around, just drop us a line and we'll take em off your hands.